Legendary Comics used Wednesday's Preview Night to give a taste of their upcoming offerings, with projects from Max Brooks, Mark Waid, Matt Wagner, Simon Bisley and Shane Davis. The press-only event, introduced by nerd personality Chris Hardwick (whose Nerdist Industries was recently acquired by Legendary) and Legendary Editor-In-Chief Bob Schreck teased two new properties from a line-up of notable creators.On hand to answer questions about their upcoming graphic novel, Shadow Walk, were World War Z author Max Brooks, comics stalwart Mark Waid (Kingdom Come, Daredevil) and Superman: Earth One artist Shane Davis. The upcoming graphic novel was described by Waid as "a story of faith, science fiction and elements of horror," dealing a Prometheus-style excursion to study a mythical valley "we've all heard of," led by a soldier who may or may not have killed his entire platoon in excursion to the same valley. Details were sparse, but it's expected to be a "big, fat graphic novel." Also in attendance was writer Matt Wagner (Mage, Grendel, Trinity) who discussed his upcoming series with Simon Bisley (Lobo, 2000 AD), The Tower Chronicles, a series of prestige format graphic novels detailing the history and modern tales of a supernatural bounty hunter with a grim and secretive past that haunts his every action. Wagner summed up the book as "What would drive a man for years and years and years and years to step out of the night and confront all the nightmares and horrors that the rest of the world has forgotten? Must be love." 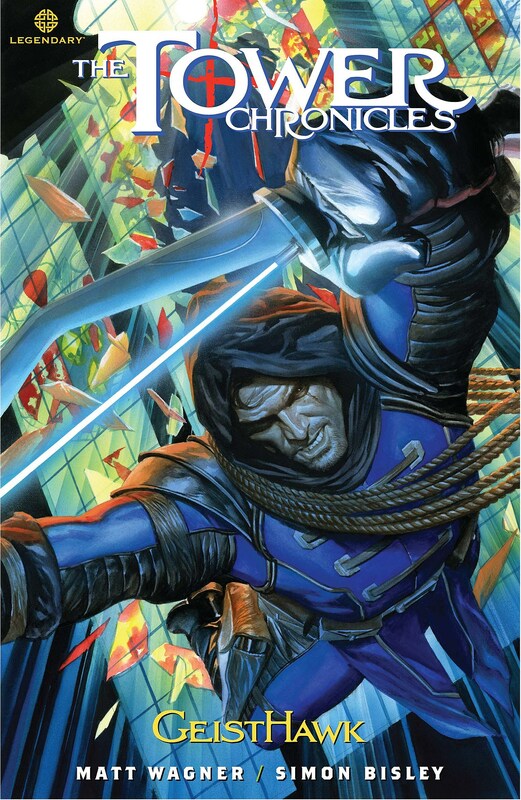 Wagner noted that Bisley, who was originally contacted to only draw a promotional image, was recruited for all three volumes of the series after Wagner saw that image and was currently working on the second of the three volumes. The first installment of the Tower Chronicles: Book One, is scheduled to be published in September. The cover for the second part of Volume One is illustrated by Alex Ross and will be released in November.